As a community of scholars and learners, Colorado College continually seeks to develop active, collaborative forms of learning that augment the opportunities for deep engagement afforded by the Block Plan. To nurture innovative teaching strategies at the College, the Fine Arts Center Museum is committed to providing faculty with personalized support to develop innovative approaches to teaching using the Museum’s resources. The Museum engages with the curriculum in all divisions through a vibrant program of exhibitions, class visits, skill-building exercises, museum-based courses, student assistantships, and faculty workshops. The museum staff is committed to supporting teaching across the college, through professional development for faculty, opportunities to link museum programs to courses, support for class projects in the museum, and opportunities for research in the collection. 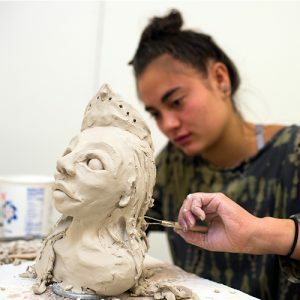 – Facilitated encounters with original works of art enhance creative and critical thinking by inviting students to reframe their understanding of a subject or apply prior knowledge to a new situation. Contact us for details or to discuss your latest idea! To schedule a class visit to the Fine Arts Center Museum for any sort of activity, guided or self-directed, please complete the Class Visit Request Form or contact Julianne Gavino, Curator of Academic Engagement at jgavino@coloradocollege.edu or (719) 477-4319. This will ensure that we know who is in the Museum and help us track attendance from the College. Please also note that the Museum may be available for class activities during hours when it is closed to the general public. Your Gold Card is your ticket to the arts! In line with education theory and practice, the Student Guide Program was developed to support museum visitors’ experiences through multiple modalities: intellectual, sensory and emotional. Student Guides moderate challenges for visitors, increasing the likelihood of a richer experience with an exhibition, taking visitors beyond their preconceived notions (such as the expectation that patrons “should” get something specific from a work of art). As a cohort, student guides learn from and support one another in the process of their work and other activities. Through group affiliation as well as through interactions with visitors, student guides develop understandings of relatedness and connections. 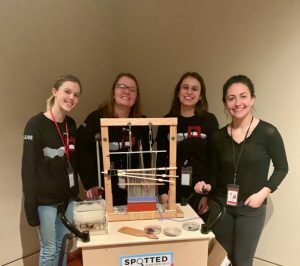 By facilitating explorations in the museum, student guides help inspire visitors to see the relations between the exhibitions, themselves and the cultures and societies around them. This teaching and exhibition space within the Museum is available to CC faculty in all disciplines who wish to build sustained engagement with material and visual culture into a Block course. Unblocked Gallery projects may include: mini-exhibitions of objects pulled from the Museum’s permanent collection; student research and/or creative response to objects; iterative displays wherein objects may be re-ordered or reinterpreted to create new curatorial narratives, or student research is continually added and modified; or the creation of a gallery/laboratory setting in which research on the composition, history, or condition of objects is conducted and information shared with the public. Usually led by Museum staff, skill-building exercises hone students’ observational, analytical, and writing abilities. Designed to meet a professor’s specific objectives, the sessions do not require previous familiarity with specific objects, but instead provide a framework for independent observation and analysis. Skills transfer to work in other disciplines that require observation, close reading, or primary source research. Observation and analysis exercises can be folded into other assignments, or can become the basis for research or creative projects. Facilitated by Museum staff and/or by the course professor, students are tasked with reframing their understandings of course content in relation to the new stimulus provided by the Museum experience. Sometimes there is a direct link between the content of the exhibition and the course topic; other times the students must work to make the connections. Designed in collaboration with Museum staff, Museum-based assignments may include elements of observation, analysis, research, critique, or creative response. Examples include (but are not limited to): providing a mathematical equation to describe the trajectory of an object photographed in motion; describing an artwork in a second language; analyzing the ways in which landscape paintings from multiple eras reveal beliefs about the environment; or creating a poetic, literary, or kinesthetic response to artwork on display. The Museum brings artists and scholars from the region and from around the world to share artwork, conduct research, perform, lecture, and engage with students. Often visitors are available to visit classes, conduct critiques of artistic or scholarly work, or work on collaborative projects with students. Museum staff can assist in coordinating these kinds of engagements. Awarded through a proposal process on a yearly basis, Faculty Fellows conduct research or work on projects that take advantage of the possibilities of the Museum and the Southwest collection for research and teaching. Desired components include: interdisciplinary approaches and topics; a collaborative approach to project development; incorporation of diverse perspectives; use of innovative pedagogies; and experiential course components. The Museum provides selected opportunities for faculty to work with Museum staff to curate exhibitions that originate from their own research and/or connect deeply with one or more courses taught during the exhibition. The Museum supports faculty development by offering both single-topic workshops and a semester-long faculty cohort. Offered in collaboration with The Crown Center, these workshops address the Museum in relation to specific learning goals. The Visual Cultures Faculty Learning Community is a semester-long series of workshops, discussions, and work sessions designed to inspire and support meaningful interdisciplinary connections between material cultures and the College curriculum. This application-based program is open to full-time faculty in all disciplines. A more complex variation on the museum-based assignment, these projects involve students directly in public museum exhibitions. Often the assignment comprises a significant portion of the work within a course. Interventions may include: writing object labels or brochure copy, producing related video content for exhibitions, sharing publically creative responses, such as dance, poetry, or monologs; and offering alternative tours of exhibitions. The Museum collection comprises over 22,000 objects, with rich holdings in American Art; Modern and Contemporary Art; and historical and contemporary art and cultural objects from the Southwest region. With advanced notice and planning, Museum staff will provide tours of collections storage for classes and will make specific objects available for study within class sessions or for research by individual students within an approved course. Students may be trained in basic objects handling under the supervision of Museum staff and the course professor.